We require 100% of booking fee if you cancel on the day you booked without any saying to us. We require 80% of booking fee a week before the day you booked without any saying to us. We changed the shower system, so you don\'t have to pay 100 coin for the shower. Also FREE TOWEL, SHAMPOO, BODY SOAP, and HAIR DRYER!! Capsule style bed has become the Japanese modern style which provides you Comfort and keep your privacy. Also, It\'s amazingly spacious, (length)210cm (width)150cm sized bed. Don\'t worry:) It\'s a GAIJIN size! Then any hotel in Shinjuku area can\'t beat this!! Then Pick it up!! You won\'t regret it and Forget about the rest. Are you looking for Taxi to go to SHIBUYA?? Then, Why don\'t you stay at the hostel which is close to every hot spots?? The hostel located in cool \'Shinjuku\' area, kind of the central place of Tokyo. You can take any JR trains or metro from Shinjuku station. It\'s definitely best place to go sightseeing, shopping, night clubs or bars. Even if you missed the last train, you could walk back to us in 20 mins from \'Shinjuku\'. \'Harajuku\', \'Shibuya\', \'Roppongi\' are waiting for you. Just 1 minute walk gets you to our hostel from the nearest subway station \'Akebonobashi\' by Toei ShinjukuLine. NO need to hassle with your luggage. 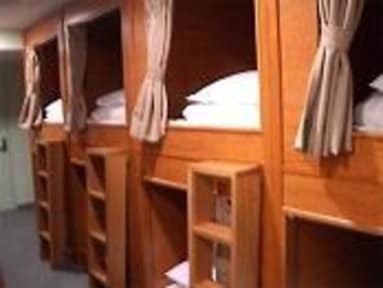 ￥2160yen 10 mixed dorm will offer a standard bed and lockers (since October 2012). 28 mixed dorm(economy) and 14 separated dorm(luxury)are \'Capusle\' styled room and offer you a locker with a key. Toilets are on each floors. We have Open floor with large TV, DVD player, couches, tables. Shower room and laundry in the basement. Every floor has air conditioning. Japanese Taiko drummer will show you the spectacular Taiko rhythm! 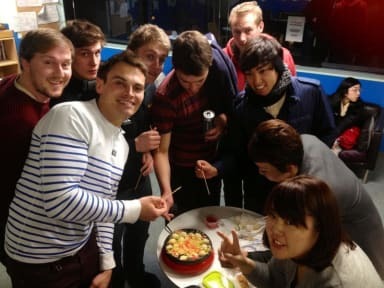 You can enjoy Sake and Taiko sound with cool travelers from all over the world and Japanese local people. Japanese calligraphy artist will write what you would like in Japanese character, Kanji or draw some Japanese dragons by the brush. Maybe your name will be made by Japanese original design. My stay at the Ace hostel was very pleasant indeed. Number one, the location is, as far as I was concerned, very good. Very close to Tokyo subway/metro, which in itself is a marvel compared to other metro systems in the world. I knew I was going to stay in a twelve-person room but to my great surprise,the way the rooms are organized there is a very great degree of privacy, the room being compartimented in such a way you will never disburb your neighbour (or be disturbed) and so on. Recommended! I stayed here for 2 nights and it was good, staff were friendly and will to help ( staff spoke quite good English). Location is good it is not right in the heart of it but I found that to be a good thing but more quite. Only down side is that the lockers that they supply you with are small and a odd shape not very useable. I would stay here again. A fine hostel. Gets the job done. I like it! You get what you pay for with this hostel. Showers downstairs with shower tokens and minimal amenities. The location is about a 30 minute walk from Golden Gai, which can prove to be a bit inconvenient. It is however close to Akebonobashi station which proves helpful during the day. It's cheap and in a great location right near the action. No frills. What's annoying are the coin-operated showers for which you have to put in a coin every 10 minutes to keep the water going. Otherwise a good, affordable hostel. Honestly for the price we paid, it wasn’t bad. I’m pretty low maintenance so for me it was fine. My sister wasn’t a fan because she felt as if it wasn’t worth the price. The ONLY issue I had was that sleeping on the beds felt like sleeping on the floor because the mattresses were so worn down. The staff was SUPER friendly and helpful though. Also the common room had a vending machine and a TV so that was nice. I was a little bummed out that it wasn’t like my other hostels where guests interact. My friend and I were there for about five days, and although the staff was nice enough, location was pretty great, and the capsule space was big, I did have a few complaints. The mattresses are too thin, it felt like sleeping directly on the wood. An elevator is your only way of accessing the ten floors of dorms. The showers are located in the basement and have a terrible pressure/token system to use. I also was expecting more of a hostel environment, but it feels more like a budget hotel. There is mold in the womans bathroom. There are multiple floors in the hostel, but the only option is male dorm or mixed dorm. There is free coffee and tea, but check the cups to see if they are clean. The beds were okay, but you are left wondering if they clean the sheets or give new ones for each guest. The lighting in the beds were too dim, you can not do much with that lighting. The blanket they give you is too thin. We made a reservation together but our beds were not together.